Thai dragon peppers are a hot variety of the fruit. Thai peppers are the reason Thai food is so spicy. There are many types of Thai pepper but all of them have a heat ranking above jalapenos and other spicy peppers. The heat ranking of a pepper is called the Scoville scale. 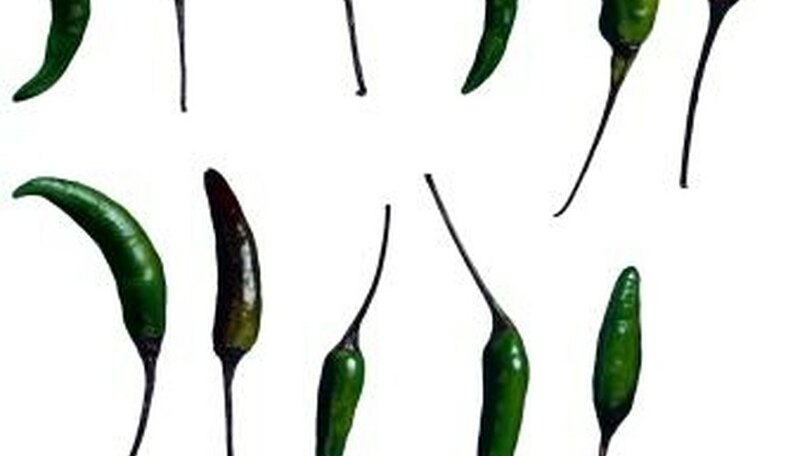 A jalapeno is a 4,000 while a dragon pepper is an 80,000 up to 100,000. The smaller the pepper the hotter it is on average. Thai peppers are harvested when the fruit is red. The dragon pepper is known as "prig ke nu" in Thailand and is one of the more commonly used peppers. You may also see it spelled "prik ke nu." The plant is a small bush with lance-shaped leaves and the fruits grow up to 3 1/2 inches long. The are slender and green but turn red when ripe and ready to harvest. Fruits are filled with seed, which if removed, can help lower the heat of the pepper. Peppers need a long growing season and plenty of heat and sunshine to ripen. In cool or temperate climates it is best to start dragon pepper seeds indoors six to eight weeks before the date of the last frost. Sow seed 1/4 inch deep in a good seed-starter mix and keep lightly moist. The seedlings need high sun and warm temperatures of at least 75 degrees Fahrenheit. Harden off the seedling and plant them in an amended and tilled sunny garden bed. Fertilize them every two weeks with an organic vegetable food. Dragon peppers can be used when green, but the flavor is not fully developed. The best taste occurs when the peppers are a bright, rich red. Use garden shears to cut off the peppers so you don't damage the plant by yanking on them. The fruit will ripen at different times due to flowering times and sun exposure. Harvesting is usually not done until near the end of summer, but in sunny tropical climes it can be year-round. Peppers are one of the foods that lose little flavor when dried. You can harvest them with the stems intact and tie them in little bundles to hang dry. You can also cut them open and remove the seeds and dry them on a cookie sheet in a low oven. A classic way of preserving the peppers is to pickle them. For easy use, cut the fruit and lightly blanch it and then freeze the peppers to add to sauces, soups and stews.